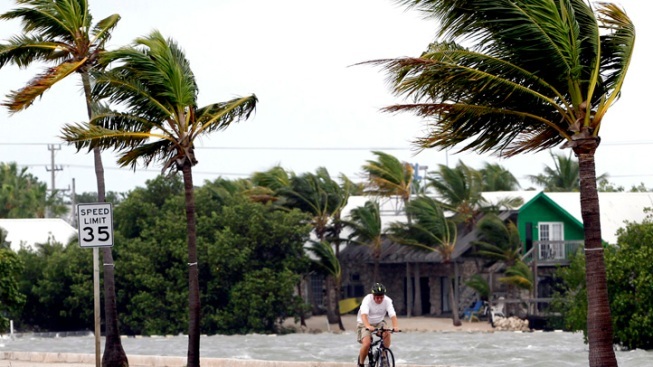 A cyclist rides his bike in Key West, Fla., Sunday, Aug. 26, 2012. Tropical Storm Isaac gained fresh muscle Sunday as it bore down on the Florida Keys, with forecasters warning it could grow into a dangerous Category 2 hurricane as it nears the northern Gulf Coast. South Florida officials are expected to approve a plan for a new mainland hurricane shelter for Florida Keys residents and their pets. The Miami Herald reports that Monroe County commissions are set to approve Wednesday a pact with Miami-Dade County and the company managing the Miami-Dade County fairgrounds. The pact would guarantee space in a storm-hardened building at the fairgrounds as a shelter for 350 people and 150 pets evacuating the island chain. The building's walls are designed to withstand 170-mph winds. The site also can accommodate hundreds of vehicles. Monroe County has not ordered a mandatory evacuation of residents since 2005. Emergency managers are trying to secure space for up to 3,000 Keys residents if a major storm should threaten the islands.